Be empowered to create yours, and share in ours. At CarMax, it all begins with purchasing, because our revolutionary customer experience starts with vehicles that are of high quality. The Purchasing team supports our core equity of "we'll buy your car, even if you don't buy ours." We appraise cars and provide written offers to purchase them. In addition, we attend auctions to buy more vehicles. Purchasing makes sure that we have the inventory we need to sell on the front lot. The Auction Services Associate is responsible for zone maintenance, vehicle preparation, vehicle receiving, inventory scanning, reconciliation, final quality of saleable inventory, vehicle movement (both on and off the lot), asset protection, and providing exceptional service to internal and external customers. This position is responsible for securing purchased vehicles, completing visual vehicle inspections as a part of the vehicle transfer process, providing vehicle optioning and imaging for the CarMax website, and working with the purchasing team to hold on-site auctions. A Buyer Assistant will also work with other departments to ensure that the needs of the business are met.. This is a management-level position for our store-focused purchasing department and offers a great career path to other positions including senior management. Buyers are responsible for obtaining CarMax’s phenomenal used-car inventory through appraisals and by attending off-site auctions. 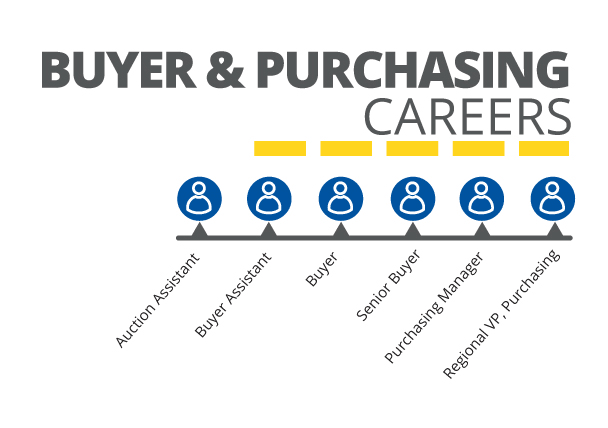 After completing the Buyer-in-Training program, a Buyer coordinates wholesale auctions, attends off-site auctions, and appraises vehicles at the store. Buyers negotiate pricing, understand vehicle condition and the subsequent costs involved in reconditioning, and make financially sound purchasing decisions for the company. This includes working with our Technicians to determine reconditioning costs and determining retail values, and working with other departments to create strong customer experiences. Senior Buyers are responsible for all the duties listed for a Buyer, plus training, mentoring, and coaching more junior Buyers. Senior Buyers are responsible for understanding retail trends and participating in the inventory planning process, organizing workloads on- and off-site. Senior Buyers also become more involved in management responsibilities including scheduling, staffing, and developing the purchasing team. Senior Buyers also act as Managers in the absence of the Purchasing Manager. This position is filled internally by a successful Buyer. The Purchasing Manager is responsible for the entire inventory of the store, from handling vehicle appraisals to off-site/on-site auctions. The Purchasing Manager leads the purchasing team, planning for optimum inventory levels, team workload and schedules, and off-site travel to auctions. A Purchasing Manager investigates changes in the wholesale and retail vehicle market and reacts accordingly. This position also motivates, leads, and trains the purchasing team and is filled internally by a successful Senior Buyer. A Regional Vice President, Purchasing is responsible for the overall purchasing operations of multiple CarMax locations within a specific region. The position requires extensive travel to all stores within a given region and is filled internally by a successful CarMax Purchasing Manager.